The OSCOR Omni Spectral Correlator provides the most automatic, reliable and cost effective capability on the market when protecting sensitive information is critical to your success. OSCOR is a complete eavesdropping detection package that is portable and programmable. Because the OSCOR is a microprocessor controlled counter-surveillance system with a custom designed built-in spectrum analyzer, it operates automatically storing all encountered signals in memory for later review. Hence, it is designed to detect all major types of audio and video RF transmitters, including carrier current and infrared. OSCOR is the only product that protects your environment 24 hours a day. Initially, automatic Signal Scanning and Logging. 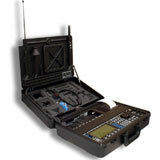 Only the OSCOR provides an automatic solution to rapidly logging and classifying all the signals of your environment. A quick reference guide provides a single chart that completely defines the programming process. Additionally, sonic ranging and triangulation offer the ability to pinpoint bug locations. Find a bugging device with no destructive searches when you use the Patented Threat Locating System,. The Triangulate and Locate option uses sonic ranging to locate a threatening microphone. Consequently, the Spectral Correlator provides the user with detailed signal analysis capabilities with a complete built-in suite of audio demodulators and IF bandwidth selections. The audio demodulators include FM wideband, FM narrowband, AM wideband, AM narrowband, Sub-carrier, Single Sideband, and IF bandwidths 250 kHz, 15 kHz, and 6 kHz. Built-in video monitors display images received on transmitted signals for protection against covert video transmitters. Supported video formats include NTSC, PAL, and SECAM. Built-in printer for hard-copy printouts. The Spectral Correlator built-in thermal printer provides a user with the ability to generate printouts of important sweep data. Every user will utilize the PC Interface and Remote Control of the Spectral Correlator . Certainly, the OSCOR Spectral Correlator PC interface software provides the capability of creating permanent database profiles of sweep environments, generate professional reports and graphs.